With a population growing generally older, nursing homes are a big subject in the world of health and medicine. A new study points to one big threat that appears in these homes. Its name is the norovirus. Researchers analyzed over 300 Medicare-certified nursing homes, and found that rates of hospitalization and death were substantially higher during outbreaks of norovirus gastroenteritis. This big health breakthrough was published in the famous JAMA publication. 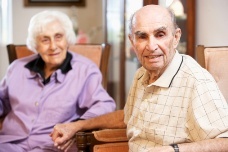 As of 2009, 3.3 million Americans live in nursing homes. Of all the people who die annually in the U.S., 22% do so in nursing homes. Gastroenteritis outbreaks are common, and the 1,000 cases reported each year is probably only a fraction of the actual number. The new study suggests that norovirus is implicated in 86% of all outbreaks. The question was: were there more hospitalizations and deaths during norovirus outbreaks? — There were hospitalizations in 119 of the outbreaks, amounting to 67,730 in all. — There were deaths in 30 of the outbreaks, amounting to 26,055 fatalities. — During norovirus periods, each nursing home had 124 hospitalizations per year. This compared to 109 in periods without norovirus. — That same statistic for deaths was 53.7 per year compared to 42 in periods without norovirus. — After adjusting for certain factors, researchers found the rates of hospitalization and death were significantly higher during outbreak periods. Residents tended to have to go to the hospital in the first two weeks of norovirus. — Nursing homes that had fewer registered nurses per patient had a significantly higher rate of deaths during norovirus outbreaks. There was no increased risk in homes with higher daily nurses hours per resident. If you live in a nursing home or someone you know does, it might be a good idea to see what the management thinks of norovirus outbreaks. What are the plans in place? Is there a history of them in the home? And, since the number of nurses per patient is a significant factor in surviving an outbreak, ask if they have an above-average rate. We’re learning more and more about the norovirus, but it never hurts to learn as much as you can yourself. Trivedi, T et al., “Hospitalizations and Mortality Associated With Norovirus Outbreaks in Nursing Homes, 2009-2010,” JAMA published online October 18, 2012.